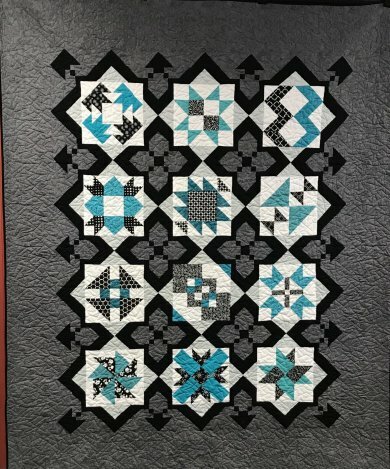 We will be starting a new Saturday Sampler Block of the Month Class on April 7th. Midnight Star is a 12 month sampler with 3 different color ways. You will be able to choose from Kansas Troubles, a black/white/turquoise, or a pastel option. The finis hed quilt will be 81 X 99. There is a $15 one time class fee, and the first month there is a $5 block fee. If you bring in the completed block at the next class, or the following Monday, you will get the next block free. If you can not attend class or bring in the finished block there will be a $5.00 charge. You will be making a 12 1/2 inch unfinished block each month. You will have the option of buying a setting kit to make the blocks 18 1/2" unfinished for $4, or you can wait and purchase a finishing kit at the end of the program.